Traditionally the Fiesta Lumbres de San Anton or Fires of San Anton is held on 16th January, this year for the first time it took place two days before on a Saturday and that's probably why hubby and I decided to go for the first time in twenty years here. The decision to change the date was to coincide with the famous San Anton running race which attracted over 10,000 runners and closed the city centre to traffic. In the plaza of the enormous cathedral there were traditional dances and songs, I'll go and watch those next year, they must be more exciting than watching a bonfire! Years ago the neighbours would have sung and dancing around each fire. 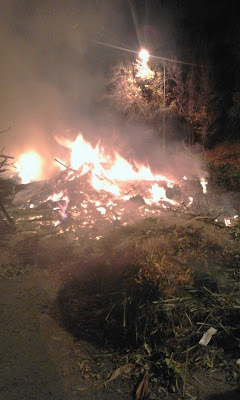 These days there are still fires lit around Jaen, smaller and spread around the city, there were more than 30 this year. We checked out where they were going to be and chose one with easy parking and a bar nearby. The bar was closed, but parking was ample and it was another place to check out, which we did a week later and had a very decent, if noisy, Saturday lunch. Not a bad spot, Bar Alambrique, near Carrefour, we'll go again but it seems they are only open at lunchtime, perhaps that's just in the winter. Anyway I'm rambling. We went to the dreaded Carrefour first (yes on a Saturday evening and horribly busy) and noticed the air was pretty smoky and reminscent of November 5ths many years ago. Then we headed out to our first lumbre on a very nippy night. It does get cold in Andalucia, in the mountains of the Sierra Sur de Jaen where I live we see extremes from -0c - +40c. This year (so far) our coldest night has been -8c. Just the once! The smoke beckoned us and we soon found an enormous bonfire on one of the old, unused roads. We approached the fire with hands outstretched and welcomed the heat. There was no singing and dancing but piped music and not very traditional either. The group, of about 40, chatted and the put-you-up bar was laden with beer cans, bottles of table wine and bread. Within a couple of minutes an old man made sure we got a drink and wanted to feed us too. 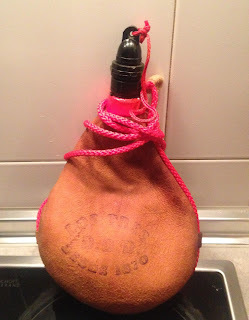 We chose the warming but not special wine out of plastic cups, but soon we were offered swig from a traditional bota or wineskin too - hubby managed to get it all into his mouth, he'd done it before! I declined, I have trouble with water bottles near my mouth, red wine from a distance with a cream coat on? No. Inquisitive as ever I asked about the fiesta and its origins. 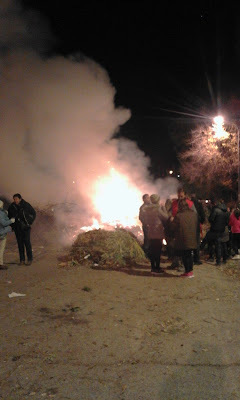 This particular Fire of San Anton was organised by the local neighbours' association, and each one across the city is run by some organisation or other. Food and drink being brought and cooked over a make shift barbecue and what more is needed! Warmth, company, food and wine. We didn't stay long feeling a little uncomfortable not being part of their association and not contributing but partaking of their fare but the warmth wasn't only from the lumbre. Spanish people are open and friendly as once again we witnessed. Yes, it helps, especially with my inquisitiveness, to speak the language but we were amazed at our quickly someone approached us. In those days there were fewer but bigger fires, I was told, so the competition between the kids to build the best fire was on. Sometimes they sat on guard all night, with loaded catapults, so nobody stole from their fire to add to another. I think these days it's a little more civilised, material to burn is easier to obtain and a nightwatch isn't necessary. But there again I didn't ask. This is a modern-day bota do you think you could drink from it? 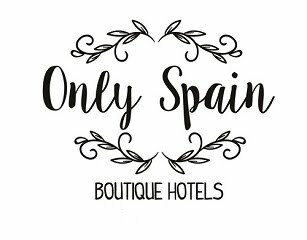 See the Monday Morning Photo list for photos of Andalucia and beyond.